It appeared out of the blue. Or out of the black, actually, on Friday night, December 15. The NYSE was furious – get that bull out of here! By the time a New York Post photographer appeared on Saturday, the 7,000 lb., 16-foot long bronze bull was already being lifted by a crane and on its way to a storage facility in Queens, paid for by the NYSE. The Post ran the picture with the heading BAH HUMBUG. This caught the attention of Arthur Piccolo. He contacted the sculptor, Sicilian born Arturo Di Modica. 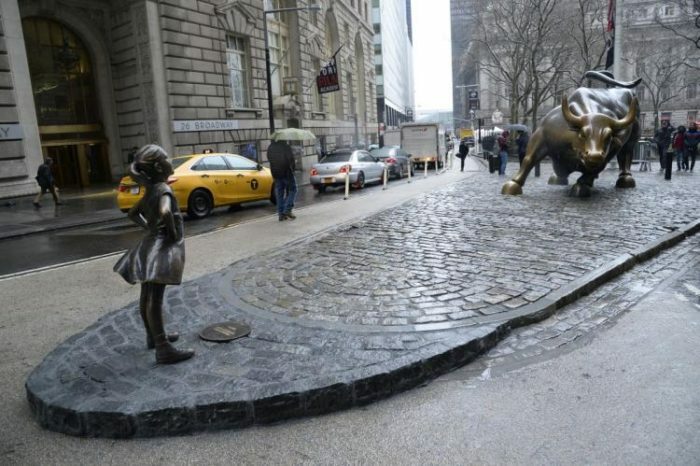 By Dec. 20th, with the help of the mayor, Ed Koch, Charging Bull was safely ensconced in Bowling Green Park, not too far from where Di Modica had placed it. Voila! It became an overnight sensation, an international destination. Every tour of Wall Street includes it. About a quarter of a century later, again in the stealth of darkness, on the eve of International Women’s Day in March, 2017, there appeared another bronze statue. A mere 50 inches tall and 250 lbs., she stood in front of the bull, her hands on her hips, her face calm. Quickly dubbed Fearless Girl, she rocked the Internet. Women, famous and not, posed with her, mimicking her pose. She got so much attention, her week-long showing was extended to one year. 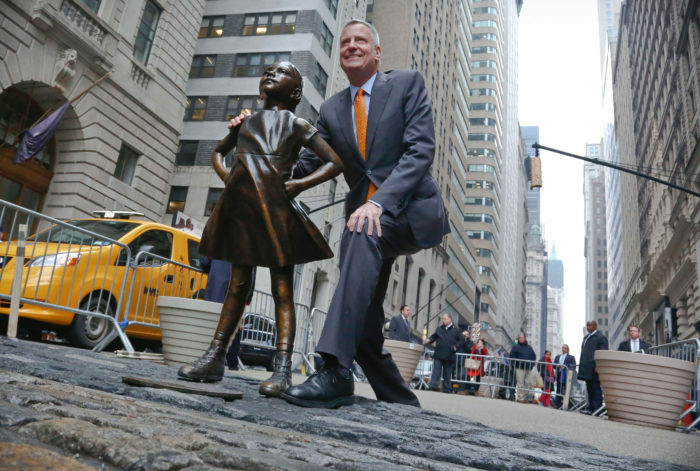 NYC Mayor Bill de Blasio poses with Fearless Girl. 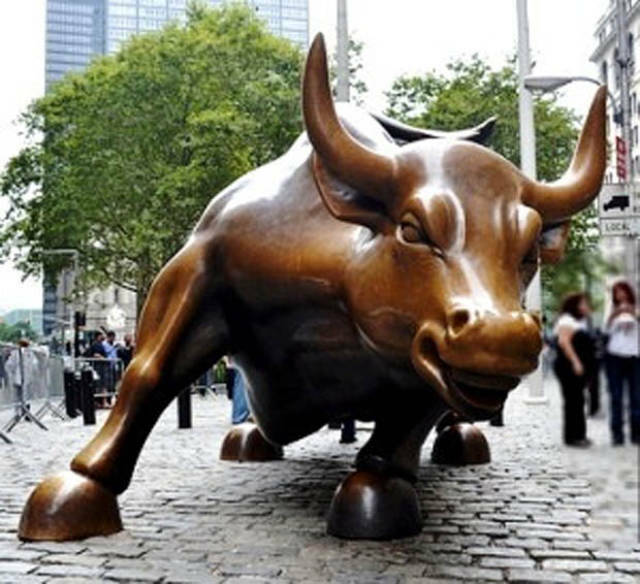 Of all people, Di Modica should be expected to appreciate the sculptor, Kristen Visbal, born in Uruguay, and this next event in the Charging Bull saga. Was he pleased? No. He is demanding that she be removed; he will “use the courts” if necessary. Someone else was not too happy, either. 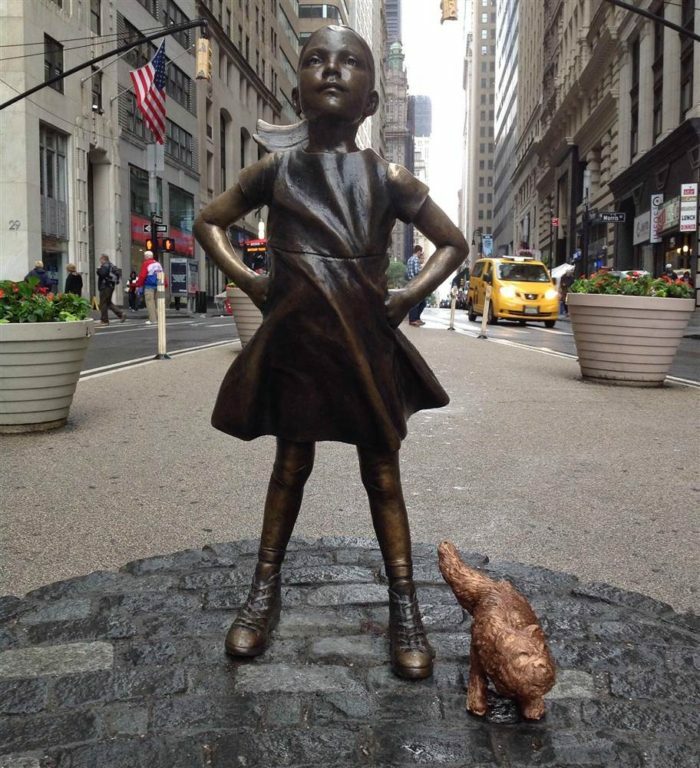 For a couple of days, a small bronze dog appeared next to Fearless Girl – lifting its leg on her! Fearless Girl creator Kristen Visbal poses alongside her work.